Thanks to FLOR Carpet Tiles for collaborating on this post. While I was in the process of looking for area rugs to use in my Living Room Design, I received a catalog in the mail from FLOR. 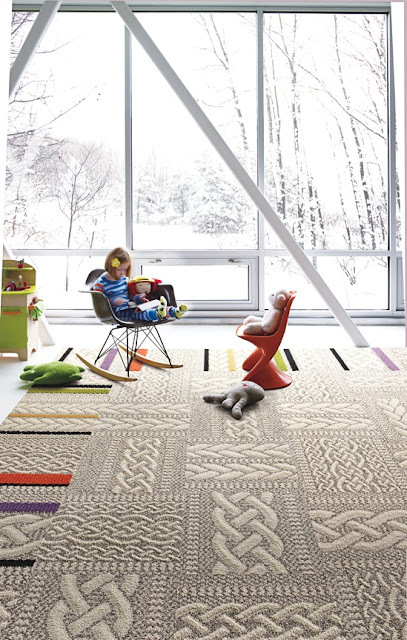 I was familiar with FLOR Carpet Tiles, but when I opened the catalog, I was smitten with their new designs. For those that are not familiar with FLOR, it is an "innovative system of carpet squares that you assemble to create custom rugs, runners or [even] wall-to-wall designs." This is the picture (via FLOR.com) that first caught my eye and made me want to see what FLOR had to offer. 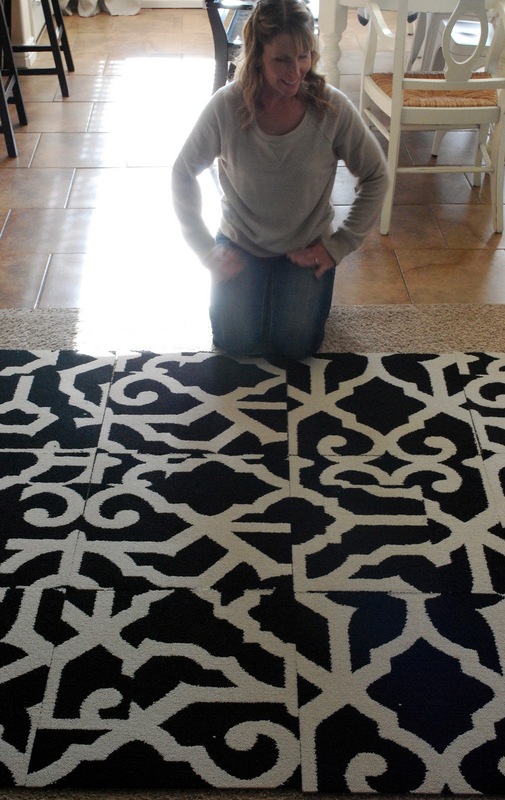 I was not only impressed by their designs, but I liked the idea that I could put the patterns together myself to create my own unique, custom rug. I used the FLOR dots to attach the tiles to one another. And that was it! One of the great things about this rug - especially for a family with little kids - is the fact that if one of the tiles gets stained or otherwise destroyed, just that tile can be replaced instead of having to replace an entire rug. In addition, FLOR tiles are environmentally friendly and can even be recycled once they have outlived their usefulness. I'm really happy with my FLOR custom rug. And I love the graphic punch it adds to the room! Disclosure: FLOR provided me with my rug in exchange for this review, but I did not receive monetary compensation. All opinions expressed in this post are entirely my own. Any quotes are taken directly from the FLOR website. It's FABULOUS! And I love your coffee table! What a cool idea and great looking rugs. I love the cable knit ones in the first picture. This is a modern, refreshing take on an old college friends "rug" which was made up of those books of rug samples you find in flooring places. Those were all different colors (hideous colors as this was the 70's) and different textures. It was functional but not at all pretty! Nice! I've heard of them, but haven't ever checked out all their choices-- think it's time. Thanks for sharing! OH I LOVE Flor carpet but have never actually purchased any!! Between my sophomore and junior year in high I lived with my grandmother as we were in the process of moving across the nation. (closer to her!!) When I returned to my parents at the end of summer a surprise awaited me.... my mother had completely decorated my room. My favorite aspect was the "patchwork" carpet she made from carpeting samples she had gathered from all over town (Denver.) It was truly a stunning effect as she had taken the time and effort to find samples that coordinated in both color and texture. Gorgeous! We've been using FLOR carpet tiles as a rug for the last 7 years (replaced tiles as necessary, and even changed out the colors). We are huge fans! I've liked the idea of FLOR carpet tiles, but for some reason always associated them with office buildings - I had no idea they had such interesting patterns. Great idea for an area rug! Awesome spotlight of what the 'new' flor is offering. I hadn't any idea that they had branched into such gorgeous patterns. Wow! Love the pattern you chose! It looks fantastic in your room. I've been looking to replace my dining room rug and hadn't thought about making my own with flor tiles. Thanks for sharing. I have never even heard of Flor carpet until now. :) THanks for sharing. I've been lusting over FLOR tiles for a couple of months now...this may make me hit the "checkout" button. Beautiful!! Wow! I've always wondered about FLOR tiles. Your rug is beautiful! I love it and how great is it that the piece can be replaced if ruined or stained..Off to check out their website..Your choice is beautiful.. This is the first time I've heard of FLOR. Looks like a great product. Superb rug design!! I also like this zebra design of yours. And top it with Flors name and you get one of the best area rugs.